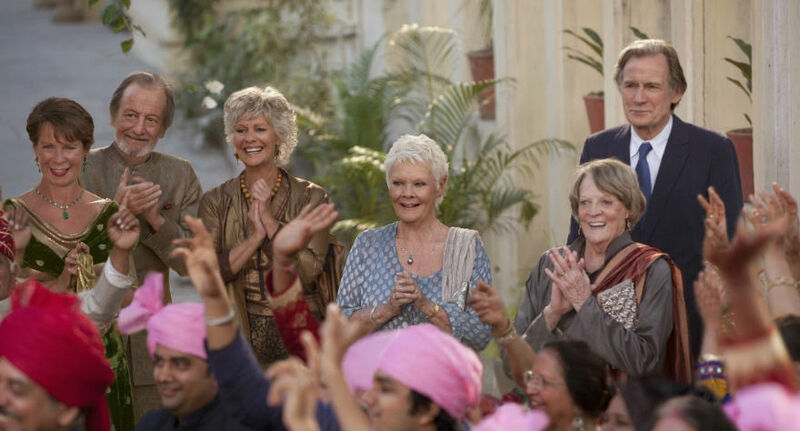 An effervescent, airy sequel that shares a comfortable co-existence with its predecessor. The success of John Madden’s The Best Exotic Marigold Hotel, the 2011 phenomenon that brought together a veritable dream team of England’s finest actors, can be easily measured by taking a look at the long, twisty lines that will undoubtedly form for the film’s sequel, The Second Best Exotic Marigold Hotel, at multiplexes across the country this weekend. Unfortunately, I anticipate that many will view the sequel as inferior because it’s a decidedly more easy-going, low-stakes affair than its predecessor. I don’t think it trumps the first film as the best of the two, but I also don’t find it fair to glibly criticize it as “second best”, either. Rather, the two films complement each other well and share a comfortable co-existence. While Best Exotic is a more dramatically textured film, but Second Best Exotic is just as textured, only comedically. Now that the residents of the Jaipur, India hotel have settled into their once-unfamiliar surroundings (the culture-clash elements from the first movie are all but gone), their problems are less urgent, though no less compelling. Cockney sh*t-talker Muriel (Maggie Smith), a one-time racist curmudgeon, has now matured and calmed down a smidge, though her barbs are as sharp as ever. She’s outwardly resigned herself to the fact that she may not have much time left in this world, though subconsciously she just might be hoping the future holds something glorious for her. Douglas (Bill Nighy) and Evelyn (Judi Dench) want to be more than just friends, but struggle to express their affection for one another, the return of Douglas’ estranged, bitter wife Jean (Penelope Wilton) complicating things further. Sitting proudly at the center of the film is Sonny (a top-form Dev Patel), the hotel’s neurotic, entrepreneurial co-manager (alongside Muriel), whose impending marriage to the effervescent Sunaina (Tina Desai) serves as the film’s main thrust. Sonny’s ambitious plans to open a second hotel have taken his mind off of the wedding, unsurprisingly driving away his beautiful bride-to-be. What’s worse, he fears Sunaina’s handsome family friend Kushal (Shazad Latif) may be in prime position to steal away his beloved. None of the film’s myriad storylines think outside the box, but the cast’s brilliant performances elevate the material. Patel is especially impressive, his comedic timing as sharp as anyone else’s, if not sharper. The needle in the film’s side is the sheer number of storylines going on all at once. Returning to the fold is horny Norman (Ronald Pickup), who’s traded in his perv card for a loyalty badge, fully committed to his lover Carol (Diana Hardcastle), who he suspects may not be as devoted to the relationship. Celia Imrie’s love-hungry Madge is back, too, this time caught in the crossed gazes of two wealthy suitors. On top of all that, Richard Gere and Tamsin Greig join the ensemble as new residents, the former’s novelist character setting his sights on Sonny’s mom, reprised by Lillete Dubey. There’s a lot to keep track of, and some of the storylines get lost in such crowded company. Everything else about the film is perfectly approachable and appealing, though. It’s a charming, sweet film, but not a saccharine one. Best of all, the veteran actors get to flaunt some new colors. Nighy gets to stretch out further comedically this time around; Douglas has taken on a job as a tour guide, hiring a young boy to feed him historical information through an ear piece. When the boy abandons his post to play soccer with his friends, the clueless Douglas is left to nervously spout unintelligible rubbish in front of the skeptical tourists (Nighy’s squirming is hilarious). Smith’s signature brash insults are actually funnier in this film, like when she flatly informs someone that, just because she’s looking at her, that doesn’t mean she’s paying attention to what she’s saying. What’s particularly refreshing about spending time with the aging eccentrics for a second time is that we don’t have to trifle with the tired fish-out-of-water theme that drove the first film. The juxtaposition of posh, proper Englishmen and women exploring a developing country is of little interest to me, and thankfully, this film isn’t interested in it either. Jaipur is a living, breathing backdrop that, instead of informing the story, permeates it in an elegant, subtle way. The characters definitely consider the hotel and Jaipur their home, and they don’t have to say it; you can see it in the way they move and occupy their environment. This unspoken message lends the film warmth. Second Best is capped off by the obligatory Bollywood dance sequence, and I’m going to level with you: I dug the hell out of it. What’s not to like about watching dozens of people in awesome clothes bopping around and having a great time? The Bollywood dance is one of the rare instances in film when you’re almost positive no one on screen is acting; they look like they’re in a genuine state of bliss, and it’s totally irresistible. Madden couldn’t help himself, and I can’t either. Sequels often shoot themselves in the foot when they retread ground already covered by their predecessors; heightened whimsy, airiness and positivity are what distinguish Second Best from The Best. In a poignant rumination near the end of the first film, Dench’s Evelyn says, “All that we know about the future is that it will be different. Perhaps what we fear is that it will be the same. So we celebrate the changes.” Cheers to that. 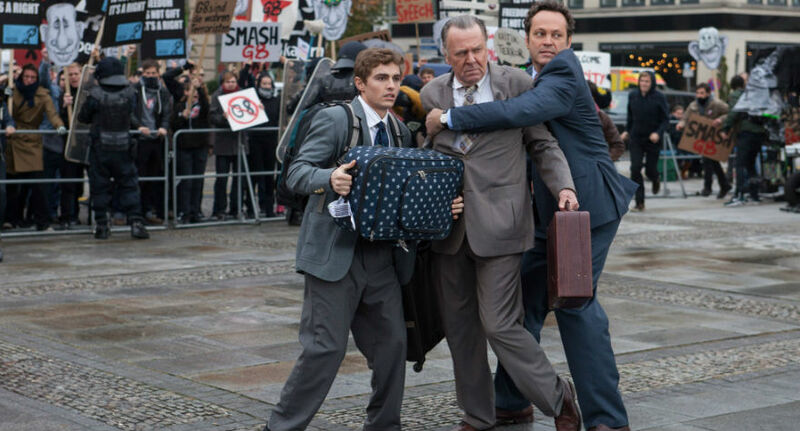 A wretched and dumpy comedy, 'Unfinished Business' is a total bummer.